Each year at my EGA Christmas Party we get a favor that's been made by the committee following a strawberry theme. They got the idea from Sampler & Antique Needlework Vol 2 that featured a strawberry reticule sewing set. 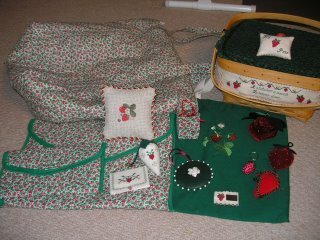 This is this what we received this past Christmas, the small berry is a thimble holder and the large one is meant to be made into a reticule to hold all my strawberry things. 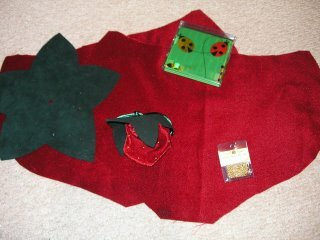 We have to do a bit of the work this year, my project before the October meeting is to sew gold beads on for the strawberry seeds and one of the members is going to teach us how to assemble it. I'm not terribly excited about sewing in all honesty but its a strawberry, and I might just like them a little. This is most of my berry things. These official theme of my accessories, because themes make it more fun, is Strawberries and Fairies. The basket is my adaptation of the Hillside Samplings Sewing basket and it just went downhill from there :) Then I found the strawberry FABRIC! I love this fabric, I think I still have 4 yards of it somewhere in the house, so I made the project pack and my mom had one of the ladies who is on good terms with her sewing machine make me the large bag in the back for my birthday a few years back. I just got my hands on a copy of the Sampler and Antique Needlework that Milady's Reticule is in so I'm hoping to at some point make the few pieces that I am missing from the collection as they didn't make all of them, just the ones that were fairly simple and could be made quickly as they were making 30+ of them every year. Love all of your strawberry stuff! What a neat collection of goodies. Strawberries are like apples...they make good collectibles!